Admittedly, I didn’t know much about Amsonia repens when I put it on my 2017 list of biodiversity goals. I knew that it was an showy wildflower that was endemic to the West Gulf Coastal Plain. This alone piqued my interest and prompted me to make it a target species. What I found, however, was a general lack of information on the species. I struggled to find a good reference with information on how to differentiate it from the very similar A. tabernaemontana. I was able to track down some historic locations, however not feeling comfortable in my ability to identify it, I failed to pursue it with much enthusiasm. I stopped at a couple of sites in 2017 where a friend had reported some a few years prior but found nothing. After that, the species went on the back burner while I pursued other more easily researched species on the list. What drew me to the Creeping Bluestar was its range, which is almost entirely confined to the eastern third of Texas. 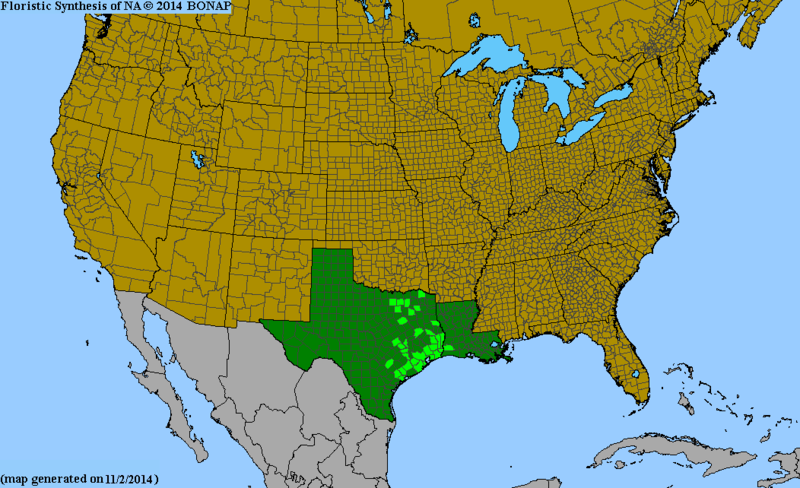 I have always had a strong interest in species endemic to the West Gulf Coastal Plain, which includes East Texas, western Louisiana, and extreme southeastern Oklahoma and southwestern Arkansas. There are a number of species that are restricted in range to this area, and this distributional pattern has long fascinated me. My interest in pursuing Amsonia repens was renewed after I photographed some Amsonia plants in bloom in remnant prairie and marsh patches in Fort Bend and Brazos County this spring. I tried once again to do some research and came across a paper that was published in March of 2019: Taxonomy of the Amsonia tabernaemontana complex (Apocynaceae:Rauvolfioidae) by J K Williams from Sam Houston State. Though this paper proposes that A. repens be considered a variety of A. tabernaemontana, it provides the best treatment I have seen on differentiating A. repens from other similarly structured congeners. In a nutshell, A. repens (or A. tabernaemontana var. repens) is best differentiated from A. tabenaemontana by having tomentose (hairy) calyces, a feature which can be seen in the image below. Interestingly, after reading this paper and reviewing other taxonomic keys, I went back to examine some photos of Amsonia that I took in Montgomery County a few years ago and found that they too were A. repens. It had been hiding under my nose this whole time! An hour or so north of Big Bend National Park, nestled between the Stockton Plateau and the Eastern Front Ranges of the Trans-Pecos lies a unique geoecological area with floral and faunal associations that seem out of place in the otherwise semi-arid desert scrub that surrounds it. The Marathon Basin, at is is commonly described, is surrounded by a series northeast trending ridges known as the Marathon Uplift, which contains a unique geology important to a suite of endemic, endangered species. The Basin’s most dramatic feature just might be a vast remnant patch of short grass prairie that appears like a vast sea of refuge from the surrounding desert scrub. I always look forward to seeing this prairie and its residents. This spring we were fortunate to see a group of Pronghorn (Antilocapra americana) among the undulating grassy ridges. The star attraction of the Marathon Grasslands, however, is the massive prairie dog town. Here a thriving colony of Black-tailed Prairie Dogs (Cynomys ludovicianus) entertains visitors to their prairie realm with their inquisitive nature, comical antics, and high-pitched alarm calls. South of the town of Marathon exist a series of ridges with conspicuous exposed layers of multi-colored rock known as Caballos Novaculite. Primarily composed of chert, this formation is the same as the Novaculite outcrops in the Ouachita Mountains of Oklahoma and Arkansas, located hundreds of miles to the east, and both exposures originated from a collision of the land masses Gondwana and Laurentia in the Late Paleozoic. The quartz present in the Caballos makes the rocks extremely hard and often sharp. The Caballos Novaculite is home to three species of endemic cacti, all of which are entirely confined to this small portion of Brewster County. Two of these species, Nellie’s Cory Cactus (Escobaria minima) and Davis Hedgehog Cactus (Echinocereus davisii) are Federally Endangered. Both species have suffered heavily from over collection and as a result are now entirely confined to private land. We were fortunate enough to observe several Echinocereus davisii plants in bloom. This is one of the smallest cactus species in the world, rarely reaching heights greater than an in and a half. They are almost entirely hidden beneath grasses and other vegetation growing among the Novaculite, rendering them practically invisible. Only when the small yellow-green flowers emerge in early Spring to they become visible. The Marathon Basin and Uplift are bordered to the northwest by the Glass Mountains. The lower slopes of this range are dominated by typical Chihuahuan Desert Scrub, where we observed a number of interesting plants in bloom, including Woolly Locoweed (Astragalus mollissimus), Feathery Dalea (Dalea formosa), and Downy Paintbrush (Castilleja sessiliflora). In my humble opinion, no trip to the Big Bend Region is complete without a stop in the Marathon Basin. It serves as a reminder of the staggering diversity of the Trans-Pecos, and a humbling exposure to the wide open spaces that West Texas is famous for. In the absence of rain, this place may seem some endless sea of stone, only occasionally broken by scattered shrubs, cacti, or other thorny things. In the hottest and driest of times it is easy to think that life shuns this place. But such thoughts could not be farther from the truth. The Chihuahuan Desert in the Big Bend region is one of the most biodiverse arid places on the planet. Perhaps there is no better time to witness this biodiversity than early spring following a wet fall and winter. Fueled by life-bringing moisture, countless billions of seeds germinate and send up a staggering array of flowers from the parched soil. Perennial species, including cactus, also react to the increased moisture by concentrating energy into blooming en masse, painting the desert in a rainbow of colors, and shattering its stereotype as a barren wasteland. After an incredible day exploring Black Gap, Caro and I set out early to Big Bend National Park in order to avoid the spring break crowds. We arrived at the Panther Junction visitor center right as it opened so that we could explore the book store and refill some of our water bottles. Within 30 minutes, the place was overrun with a variety of characters, all from different walks of life, seeking different experiences, yet united in their admiration for this incredible place. Wanting to avoid the bulk of the crowds, we opted to explore some remote 4X4 roads, which would offer ample opportunities to explore a variety of habitats. It was a good choice, and aside from a few vehicles before lunch, we had countless acres of wilderness to ourselves. As the day began, we stopped to admire an explosive bloom of Bicolored Mustered (Nerisyrenia camporum) in the dry bed of Tornillo Creek. The blooms are strongly fragrant and filled the spring air with their sweet aroma. In areas adjacent to the creek we found the mustard blooming alongside some towering Big Bend Bluebonnets (Lupinus havardii) and a variety of other wildflowers, offering a varied sampling of the palette that the desert was soon to provide. We had seen our fair share of Big Bend Bluebonnets in Black Gap, but Big Bend provided a whole new perspective to this striking plant. The sky was overcast all day, providing a soft light that made landscape photography a challenge, but provided excellent opportunities to capture intimate portraits of many of the incredible wildflowers that we encountered. Some of the bluebonnets we encountered were approaching four feet in height, and sported racemes bearing dozens of flowers. While passing adjacent to a series of gypsic hills, Carolina shouted for me to stop. This is usually a good thing, and means that she has spotted something interesting. And indeed she had. She pointed to bright yellow spot on a hillside hundreds of meters away. How she spots these things, I’ll never know. Moving closer to investigate, it soon became evident that it was a healthy Texas Rainbow Cactus (Echinocereus dasyacanthus). This is a species that I included in my list of biodiversity goals. I have seen the plant many times, but had never experienced the splendor of its blooms. I was concerned that we were too early, but I was very wrong. We would find many plants in full, glorious bloom in the lower elevations of the park. I had always presumed these cacti had a preference for limestone, but we saw them in a variety of substrates throughout the day. They have some of the most striking blooms of any cactus. They are generally lemon yellow with green throats, and may approach 4 inches across. Interestingly, their common name is not derived from their stunning flowers, but rather the rusty-colored bands decorating their stems. Seeing many old, multi-stemmed individuals in such a remote setting was certainly one of the highlights of the trip. A few of the plants contained Cactus Bees (Diadasia sp.) feeding on nectar from deep within the blooms. The bees’ hairy exoskeleton served as the perfect vessel for trapping pollen, ensuring that the insects would play their part in propagating future generations of Texas Rainbow Cactus. There were other species of cactus in bloom as well. Perhaps the most conspicuous were the large colonies of Purple Prickly Pears (Opuntia azurea), which were just coming into flower. The blooms of most cactus species open in late morning or early afternoon, and close by late afternoon. It was a wonderful thing to see these prickly pear flowers open to reveal their bright red centers to the world. While it was easy to get lost in the grandeur of endless expanses of blooming wildflowers, pausing to admire more subtle, intimate scenes proved just as rewarding. I photographed the Edward’s Hole-in-the-Sand Plant (Nicolletia edwardsii) and Sand Bells (Nama hispidum) just after the latter’s flowers opened for the day. The combination of wildflowers was endless. Below Pope’s Phacelia (Phacelia popei) can be seen blooming alongside Bicolored Mustard along an ephemeral drainage. Pope’s Phacelia and Bicolored Mustard bloom along an ephemeral drainage. The kaleidoscope of colors continued in this rocky wash, where I spotted several nice clumps of Havard’s Fiddleleaf (Nama havardii), known in the United States only from the Big Bend region. Havard’s Fiddleleaf and Bicolored Mustard bloom in a gravelly wash. It seemed like around every bend in the road there was some new fusion of color to be discovered. One of my favorites was the combination of the yellows of Desert Marigold (Baileya multiradiata) and the purples of Nama hispidum blooming among scattered Ocotillo and Creosote Bush. Baileya multiradiata and Nama hispidum bloom in profusion. Deep in the interior of the park, we explored a series of limestone ridges and shale slopes on hills rising from the Rio Grande. Here we found many interesting, uncommon species like the Lyreleaf Jewelflower (Streptanthus carinatus). This denizen of the desert southwest bares purplish blooms in Texas, but they are primarily white and yellow as one moves further west in their range. We found several Candelilla (Euphorbia antisyphilitica) plants growing in the same general area. This interesting succulent has a long history of use by human cultures. As the specific epithet suggests, it was long used to treat sexually-transmitted diseases. It has also been extensively harvested for a wax produced from its leaves. This wax has been used for a variety of applications, including use as a food additive for glazing agents, as an ingredient in lip balm, and perhaps most famously as a binder for chewing gum. On one of the limestone slopes Caro spotted a beautiful Texas Rainbow Cactus that sported bright orange flowers as opposed to the more typical lemon colored blooms. We saw a few of this color, and even a few with a pinkish tinge. Caro’s sharp eyes also spotted the diminutive Duncan’s Foxtail Cactus (Escobaria duncanii), a rare cactus is primarily confined to a very narrow range near the Rio Grande in Big Bend and adjacent Mexico, though there is an isolated population in New Mexico. This cryptic cactus grows from fissures and crevices in the limestone and is one of the first cacti to bloom in spring. By our visit in early March, many of the blooms were already spent. Another cactus I had really hoped to see was Warnock’s Pineapple Cactus (Echinomastus warnockii), named for the famous botanist and pioneer of the flora of the Trans-Pecos, Barton Warnock. We actually saw several with closed blooms in the early afternoon, however this species opens later than most and we couldn’t wait around. Fortunately Caro spotted one growing in a clump of dried grass on one of the limestone slopes a couple hours later. Like many cacti of the region, E. warnockii is known only from West Texas and adjacent Mexico. Those limestone hills were full of a diversity of cactus! Caro spotted another rare, early-blooming species, the Silver-Lace Cob Cactus (Escobaria albicolumnaria). Consider by some to be a variety of Escobaria sneedii. When investigating the cacti of Texas, one notices a pattern: many species are confined only to the Big Bend region. In fact, this (relatively) small area in West Texas has the highest diversity of Texas in the United States. E. albicolumnaria is another early bloomer, and sports pink flowers that never open fully. Throughout the day we had seen several clumps of Big Bend Prickly Pear (Grusonia aggeria), another species whose U.S. range is confined to far West Texas. A type of “dog cholla”, this cactus sports very sharp, strong spines that can become the bane of any desert wanderer. Fortunately the bright yellow blooms make up for their pricklier side. As the day neared its end we found some clumps of Purple Prickly Pear loaded with blooms and developing buds. Their beauty combined with that of a carpet of composites and Nama, and the Chisos Mountains as a backdrop created a dramatic scene that I felt privileged to witness. Throughout the day we saw several blister beetles (Cysteodemus wislizeni) scurrying across the desert floor. These chunky, iridescent beetles are flightless, and their elytra (outer wings) are partially fused. They were constantly in motion, providing a challenge to photography, but it was a challenge I welcomed as I chased after them, camera in hand, uttering colorful phrases in my frustration. While I was busily tending to the beetles, Caro came rushing over to me with her hands cupped one over the other. What she revealed was a large grasshopper, which I believe to be a female Toad Lubber (Phrynotettix robustus). I placed it adjacent to a few plants of the diminutive Matted Fiddleleaf (Nama torynophyllum). As afternoon turned to evening we once again found ourselves among the overwhelming beauty of vast expanses of Big Bend Bluebonnet. For the briefest of moments the sun broke through the wall of clouds, and illuminated the bluebonnet laden slopes and distant Chisos Mountains. As the light began to fade I thought back on one of the most incredible days I had spent in the desert. Just as I was expecting photography to wind down, I caught a flash of pink in a sandy desert wash. It was a species that I had very much hoped to find: Havard’s Ipomopsis (Ipomopsis havardii), another generally uncommon species unique to the region. I quickly went about photographing it, as daylight was fading fast. Though they are small, the colorful blooms are among the most interesting that I have seen. As I finished photographing the Havard’s Ipompsis, the light faded fast. We spent last light driving through an expanse of volcanic tough that looked like some alien landscape. As darkness set in we still had 10 miles until we would reach pavement. It was an eerie feeling driving through some of that terrain in total darkness. The eeriness did not diminish after we returned to pavement. Shortly after doing so we pulled into a parking area to stretch our legs. Immediately after leaving the truck we heard a pair of Coyotes sounding off. Now I have spent many evenings being serenaded by the mournful calls of “God’s Dog”, and they often deceive one into thinking they are much closer than they actually are. But these were CLOSE. Caro suggested that I turn on the headlights, and as I did we could see the pair just at the edge of the beam’s reach. They trotted across the road and continued into the vast desert beyond. The experience rounded out a most spectacular day. I leave you with a parting shot, of a splendid Texas Rainbow Cactus in all its glory, thriving in the desert flats below the venerable Chisos Mountains. I look forward to sharing our finds, experiences, and of course my photographs of a very special spring in this important, biodiverse region. When General Manuel de Mier y Teran crossed the Pineywoods, East Texas was a patchwork of habitats. Pine-dominated forests were largely restricted to upland ridges, while gentle slopes and stream floodplains were dominated by hardwoods. And situated within this matrix of woodlands, where soil conditions and disturbance regimes were just right, existed prairie patches that supported plants and animals typical of the great tallgrass prairies that extended from the Texas coasts into southern Canada. Less than hundred years after Teran’s famous expedition, the Pineywoods would be forever changed – scarred by the saw, and later the steam engine and the dozer. Virtually all of the magnificent virgin forests were cut. Pockets of prairie were converted to pasture and agriculture, or developed for human habitation. As their habitat disappeared, so did many of the prairie obligate species that depended on them. The conversion of prairie habitat is not unique to East Texas. It has occurred, and continues to occur throughout the country, and many species continue to experience precipitous declines as a result. Some grassland dependent songbirds, for example, appear to have declined by over 90% in a matter of decades. It has become evident that if drastic measures are not taken, some of these species may be lost forever. There is a ray of hope in this story of doom and gloom, however. Within the past few years, a prairie amphibian that had not been recorded from the heart of East Texas for decades was relocated by Toby Hibbitts and other herpetologists in a concentrated survey effort across its historic range in Texas. The characteristic “snore” of the Crawfish Frog (Rana areolata) was once again heard in the Pineywoods. Like the grassland songbirds, the Crawfish Frog has been experiencing sharp declines in the past several decades and is considered a species of conservation concern in most states where it occurs. Its strongholds in Texas are in the western reaches of the coastal prairies and marshes and portions of the Post Oak Savannah and Blackland Prairies. Hibbitts, et. al. discovered that they were still hanging on in isolated populations in the Pineywoods. I never thought I would see one of these enigmatic prairie dwellers in the Pineywoods. I imagined it had gone the way of the Jaguar and the Black Bear – something lost to my generation. So when suitable conditions presented themselves this spring Carolina and I set out one misty evening with our good friends James and Erin to see if we might find one. In all honesty my hopes weren’t all that high. It has been a weird spring this year, with a lot of moisture and wildly fluctuating temperatures. But within 30 miles of our house, we spotted a mottled form on the pavement in front of us. I rushed from the car and found before me a mangled mix of frog skin and guts. It was a roadkill Crawfish Frog. It was a bittersweet feeling for sure. I had seen a Pineywoods areolata, but it was dead. Freshly dead at that, as its rear legs were still twitching. I was at the same time disappointed and encouraged. As I took the frog in my hands and soaked in the tranquility of the evening, I could feel my ears perk as they drew in a distant sound. In that moment Erin turned off the engine and the night came to life. The ratcheting call of Cajun Chorus Frogs reached me first, followed by the cackling song of Southern Leopard Frogs. Then I heard it, fainter and more distant than the rest – the nasal snore of the Crawfish Frog. We bagged the dead frog in order to send to Toby for his research. I then wandered down the road, flashlight in hand. After a while I noticed a turn for a side road heading in the direction of one of the frog choruses. The night was very dark and a thin veil of mist hang suspended in the air. With my light I could only see where the road began. I turned down this road, and soon found myself walking a two track gravel pathway pushing out into what looked like a pasture. I could not see any “No Tresspassing” signs or purple paint, and there were no lights anywhere on the horizon. Convinced that it was not private property, I continued. The chorus grew louder. I scanned my flashlight in all directions. There was a fence to my left, and to my right there were several granite pillars emerging from the fog. It became clear that I was wandering through a graveyard. Despite the eeriness of the situation, I felt comfortable, and continued on joined by the rest of the party. We soon realized that the frogs were calling in a pasture beyond the fence, in a place we could not reach. So we decided to continue down the road, but first made our way through the cemetery toward its exit. I swept the beam of my flashlight across the ground, and to my surprise caught glimpse of a reticulated, spotted thing resting among emerging shoots of grass and prairie forbs. It was a Crawfish Frog. I couldn’t help but smile. We found one. It was a beautiful animal, and a female of decent size. Immediately after seeing us she arched her back and inflated her mid section in order to appear larger, more threatening. This defensive posture also presents potential predators with a more difficult-to-swallow prey item. Crawfish Frogs are dependent on prairie communities, where they spend most of their lives in or around crayfish burrows. In this part of the state they may utilize burrows of the Texas Prairie Crayfish (Fallicambarus devastator), a species endemic to a handful of counties in East Texas. We would see many that night. Research has shown that the frogs utilize both primary and secondary burrows. They spend most of the year at primary burrows, while they utilize secondary burrows while migrating to and from breeding sites, and perhaps to a lesser degree while foraging during prolonged periods of rain outside the breeding season. Crawfish Frogs breed in ephemeral wetlands formed in prairie depressions and in fishless manmade ponds located within suitable habitats. They have a prolonged breeding period in Texas, but generally breed en masse following warm rains in early spring. Interestingly, these frogs are able to persist in heavily grazed areas. Presumably, it is because they are heavily dependent on the condition of the soil rather than the structure of vegetation. It is important that the soil column and crayfish burrows remain in tact. In areas where the soil is tilled or otherwise disturbed, the frogs quickly disappear. She would be the only Crawfish Frog we would see that night, though we did hear a few more choruses. It was an incredible experience. While encountering a seemingly thriving population in the Pineywoods certainly gives me hope, it does not change the fact that this species is on the decline and highly susceptible to the loss of our prairies. We need to “want” to have this species around, and make a serious effort to conserve its habitat, or the story of its status in the Pineywoods fifty years from now may be a very different one. Fortunately there seems to be a genuine interest in research and conservation of the Crawfish Frog in the Lonestar State, and I remain hopeful that when the conditions are just right on warm, rainy spring nights, future generations of East Texans will continue to hear the peculiar snore of this special prairie denizen.